Not sure how this depicts Temperance? Click here. Etteilla: Moderation, Soothing, Treating Carefully, Temperature, Clergy, Church, Religion. Lévi: This hieroglyph depicts Temperance, an angel with the sign of the sun upon her forehead, and on the breast the square and triangle of the septenary, pours from one chalice into another the two essences which compose the elixir of life. Christian: This Arcanum is represented by the Spirit of the Sun holding two urns and pouring from one into the other the vital sap of life. Papus: The following ideas are expressed by this symbol: combination of different fluids; and individualization of existence. The genius of the Sun pours the fluid of Life from a golden vase into a silver one. 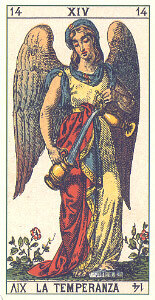 Illustration (right): Temperance from Antichi Tarocchi Italiani (Ancient Italian Tarots) (c. 1880) (copyright &COPY; 1996 Lo Scarabeo). Click the image for a larger one. Felkin: This is the equilibrium not of the balance of Libra but of the impetus of the Arrow, Sagittarius, which cleaves its way through the air by the force imparted to it by the taut string of the Bow. It requires the counterchanged forces of Fire and Water, Shin and Qoph, held by the restraining power of Saturn, and concentrated by the energies of Mars to initiate this impetus. Waite: This card is called Temperance fantastically, because, when the rule of it obtains in our consciousness, it tempers, combines and harmonises the psychic and material natures. Under the rule we know in our rational part something of whence we came and whither we are going. Wirth: Death decomposes the container in order to liberate the contained that one can envisage as a liquid unceasingly poured from one perishable vessel into another without one drop being wasted. This Key shows us this vital fluid poured from a silver urn into a gold one by Temperance who becomes the angel of universal life. Case: Upon the fiery lion the angel pours water. From the torch in his left hand flames fall on the head of the eagle. Water on fire, and fire on water, or the action and reaction of opposites, is thus shown; and this carries out the general idea of tempering or modifcation indicated by the title of this Key. Illustration (left): Temperance from the Builders of the Adytum [BOTA] Tarot Deck (c. 1930), designed by Paul Foster Case and drawn by Jessie Burns Parke, adapted from The Tarot: A Key to the Wisdom of the Ages by Case (copyright &COPY; 1947 Case). Click the image for a larger one. Crowley [who replaced Temperance with Art]: At the bottom are seen Fire and Water harmoniously mingled. But this is only a crude symbol of the spiritual idea, which is the satisfaction of the desire of the incomplete element of one kind to satisfy its formula by assimilation of its equal and opposite. Gray: Good management, adaptation, coordination, modification. The use of successful combinations. The individualization of existence. Sadhu: This Arcanum is the law of universal equilibrium; the balance of forces in the manifestation of the universe; a similar balance in pentagrammatical (human) beings, and as a result of the realization of both, the idea of the final, perennial peace, being the substratum of all movements and changes. ONeill: For the Dualist, the pessimistic Gnostic, Temperance would have implied asceticism: keeping the instincts under control. But in the traditional Christian view, all of the virtues are seen as middle paths. In the case of Temperance, the path is between starvation and glutony, between libertinism and austerity. Pollack: The term temperance means moderation. For most people this means self control. The Tarot Temperance, however, does not go to extremes simply because extremes are not necessary. Not an artificial inhibition according to a moral code, but exactly the opposite; a true and proper response to all situations as they arise. Turk [who also replaced Temperance with Art]: The meaning of the word Art is not that of aesthetic merit in drawing and painting, or even in other mundane creative activities, but the Art of directing the will in a focused manner. Formerly, this card was known as Temperancewhich meant the process by which the sword of willpower was forged and tempered by self-analysis. Symbol (above): It depicts liquid flowing between two chalices, which often comprises, in part, this Arcanum.